Snow day! It’s been at least two decades since a storm last prompted a bunch of Salt Lake County schools to cancel classes. (Jeremy Harmon | The Salt Lake Tribune) Sampset Sompsou shovels the walks outside his apartment building in Salt Lake City following a heavy storm on Wednesday, Feb. 6, 2019. (Francisco Kjolseth | The Salt Lake Tribune) Chester and Moqui play in the snow as Rachel Haisley returns from a walk as Salt Lake residents dig out following a heavy snow storm on Wed. Feb. 6, 2019. (Francisco Kjolseth | The Salt Lake Tribune) Barbara Bean clears the way to get her car out of the driveway as Salt Lake residents dig out following a heavy snow storm on Wed. Feb. 6, 2019. (Francisco Kjolseth | The Salt Lake Tribune) Nick Norris takes out the backcountry ski gear as he skins along Harrison Ave. as Salt Lake residents dig out following a heavy snow storm on Wed. Feb. 6, 2019. (Francisco Kjolseth | The Salt Lake Tribune) Richard Mucha brushes off his car as Salt Lake residents dig out following a heavy snow storm on Wed. Feb. 6, 2019. 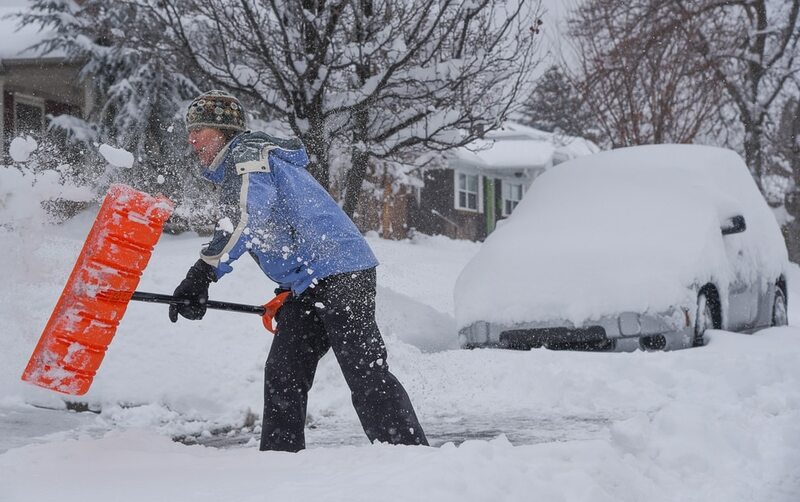 (Francisco Kjolseth | The Salt Lake Tribune) The Salt Lake Valley gets pounded with inches of snow as Scott Coles clears a driveway on Wed. Feb. 6, 2019. (Francisco Kjolseth | The Salt Lake Tribune) Cole Kucer, 9, takes advantage of a snow day to get some fort building in as Salt Lake residents dig out following a heavy snow storm on Wed. Feb. 6, 2019. (Francisco Kjolseth | The Salt Lake Tribune) Mira Tueller, Cecilia Prudden and Ellie and Max Rizk, from left, take advantage of a snow day after school was cancelled in the Salt Lake due to the heavy snow storm on Wed. Feb. 6, 2019. (Francisco Kjolseth | The Salt Lake Tribune) Max Rizk, 6, takes advantage of a snow day after school was cancelled in the Salt Lake due to the heavy snow storm on Wed. Feb. 6, 2019. 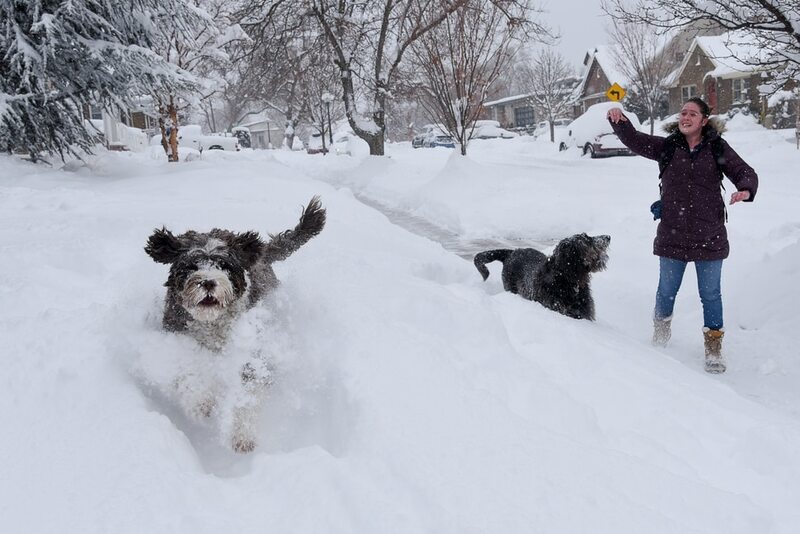 (Francisco Kjolseth | The Salt Lake Tribune) Bert relishes in the snow as Mira Tueller, left, tries to keep up with her neighbor's dog's regular request for flying snow as Salt Lake kids take advantage of school being cancelled due to a heavy snow storm on Wed. Feb. 6, 2019. (Francisco Kjolseth | The Salt Lake Tribune) Jayde Prudden, a 4th grade teacher at McGillis School has a little fun as she takes advantage of school being closed to don her one piece purple retro ski suit and take her cruiser for a spin along the snow covered streets in her neighborhood as Salt Lake residents dig out following a heavy snow storm on Wed. Feb. 6, 2019. 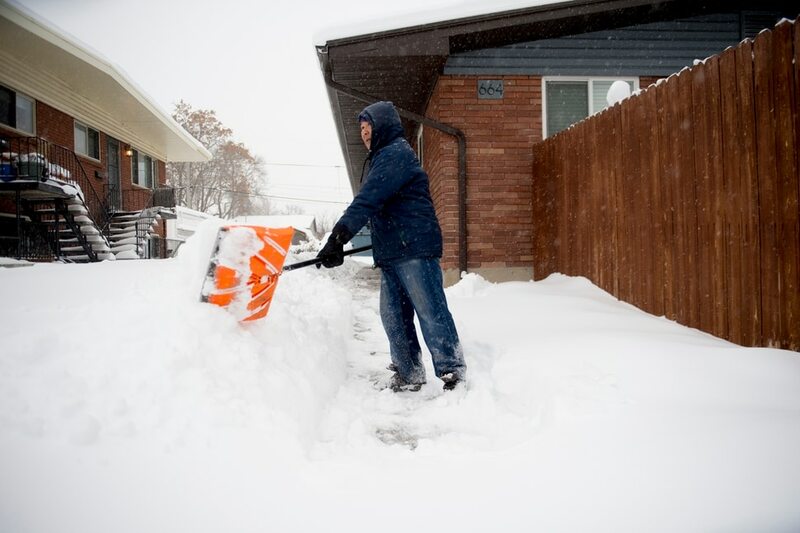 Leah Hogsten | The Salt Lake Tribune A bad knee and a bad hip forced Linda Pay to sit on a bucket while shoveling the snow in front of her home in Rose Park on Wednesday. The National Weather Service predicts that snow, heavy at times, could also impact commuters who are heading home this evening. The drive could be particularly rough for those traveling through wester Salt Lake County, where one to two inches of snow is expected to fall per hour through the afternoon. Leah Hogsten | The Salt Lake Tribune They love getting out, said Masani Tyler of her parakeet Soleil and cockatiel Simon of their family walks on the Jordan River Parkway, even in the snow falling on Wednesday. Tyler walks with her feathered family members confined in a backpack designed for cats that she modified for her birds. The National Weather Service predicts that snow, heavy at times, could also impact commuters who are heading home this evening. The drive could be particularly rough for those traveling through wester Salt Lake County, where one to two inches of snow is expected to fall per hour through the afternoon. Leah Hogsten | The Salt Lake Tribune They love getting out, said Masani Tyler of her parakeet Soleil and cockatiel Simon of their family strolls along the Jordan River Parkway, even in the snow falling on Wednesday. Tyler walks with her feathered family members confined in a backpack designed for cats that she modified for her birds. The National Weather Service predicts that snow, heavy at times, could also impact commuters who are heading home this evening. The drive could be particularly rough for those traveling through wester Salt Lake County, where one to two inches of snow is expected to fall per hour through the afternoon. Whatever else it was — a chance for kids to sleep in, to go sledding or build a snowman taller than Utah Jazz’s Rudy Gobert — the snow day for schools along the Wasatch Front was a rarity. It’s been at least two decades, possibly more, since the last one. All five public school districts in Salt Lake County canceled classes, as did Park City and Tooele, too, as a late-night snowstorm dumped more than a foot of snow some places and left ice-coated roads in others. By morning, the University of Utah, Salt Lake Community College, LDS Business College and Westminster College also closed their campuses for the day as flakes continued to fall. Most students and educators were simply smitten by the unexpected holiday. (Francisco Kjolseth | The Salt Lake Tribune) Jayde Prudden, a 4th grade teacher at McGillis School has a little fun as she takes advantage of school being closed to don her one piece purple retro ski suit and take her cruiser for a spin along the snow covered streets in her neighborhood as Salt Lake residents dig out following a heavy snow storm on Wed. Feb. 6, 2019. 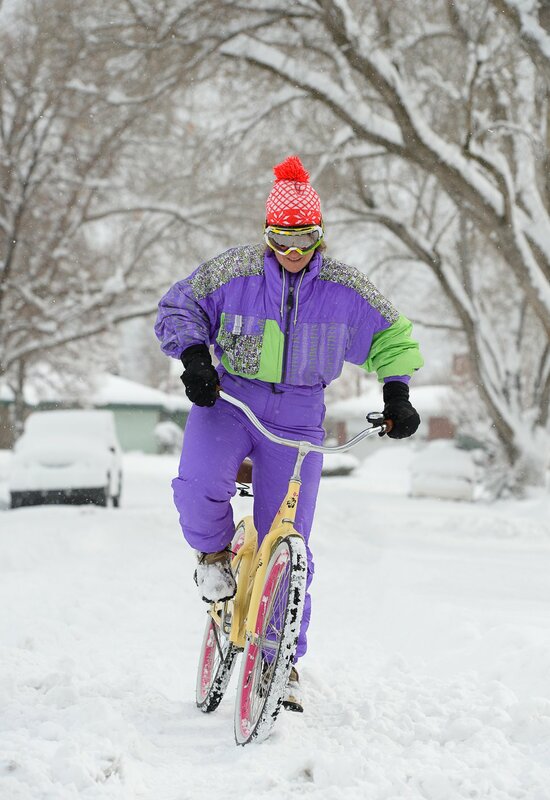 Jayde Prudden, a fourth grade teacher at The McGillis School in Salt Lake City, put on a neon ski suit and rode her bike around in the snow. Two teachers at Granite Park Junior High posted pictures of themselves riding carts down the school’s empty hallways and playing dodgeball. Sue Childress, the director of nursing at the Huntsman Cancer Institute at the U., slid across campus in a pair of cross country skis. Some parents posted pictures wearing white T-shirts that said, “Snow day supporter,” along with shots of their kids having snowball fights. John Hunt, a Utah father of nine, said he had a snow day during his senior year at Cyprus High School in January 1993. Now, his son is a senior in the same school district and is having his first snow day. “It’s bringing back memories,” Hunt, now 44, said. He remembers his mom coming into his room, saying, “There’s no school today. There’s a lot of snow — go outside and look.” He spent the rest of the day building a snow fort. His twin brothers, 8, danced around the family’s kitchen Wednesday morning, chanting “Snow day! Snow day! Snow day!” They were bundled up in coats and mittens by 11 a.m.
“They’re excited. They’re getting their snow gear on,” John Hunt said. Most of the closed districts canceled after-school programs, too. And school districts that chose not to cancel classes took some heat. Alpine School District decided to stay open, posting on Facebook and Twitter: “Our plow crews and custodians have been out working hard to make sure schools are ready for business today.” And that led to a slew of comments — more than 1,200 — mostly from angry parents. Kimberly Bird, the district’s spokeswoman, said Utah County didn’t see as much snow as other places. She added that Alpine ultimately decided to hold school so that students would have a safe spot and parents who work wouldn’t need to find child care. The district includes SunCrest, a development area near Draper, that sits on a steep hillside, as well as Lehi that gets large gusts of wind. Nearby Provo and Nebo school districts also did not close. And many students there posted that they were jealous of their peers who got a snow day. Riesgraf said Jordan School District employees were out monitoring the roads all night and decided at 3 a.m. that conditions were getting worse and they wouldn’t hold classes. Still, there will be at least one employee at every school throughout the day just in case a student showed up. It’s been at least 18 years since Salt Lake City School District has had a snow day. And at Canyons School District, which was created about 10 years ago at the south end of Salt Lake County, this is the first snow day in its history. It’s likely the missed school day will be made up on President’s Day, on Feb. 18, but the district is still deciding and anticipates announcing that later this week. Granite School District plans to have students make up the missed day May 24 — which falls one day after some of its high school seniors graduate. The most recent snow day that The Salt Lake Tribune reported on was in January 2017, and it affected mostly northern Utah schools with closures at Box Elder County, Bear Lake County, Cache County and Logan districts. There hasn’t been anything as widespread in Salt Lake County in recent years. Jean Hill, a mother of three and a government liaison for the Catholic Diocese of Salt Lake City, said her kids walked to a nearby hill to go sledding. Her son, a sophomore at Judge Memorial High School, still got a chemistry assignment from his teacher — who posted at 7 a.m. that’s “it’s 2019 and we have the internet” — but he decided to push it off until after he got outside for a bit. “It’s not done yet, but he’s telling me it’s not going to be too hard. We’ll see what grade he gets on it,” Hill said with a laugh. This is the first snow day her kids have had in Utah, where residents pride themselves on plowing bravely through feet of powder when people in other states stay home over an inch or less. — Salt Lake Tribune reporter Sean P. Means contributed to this story.